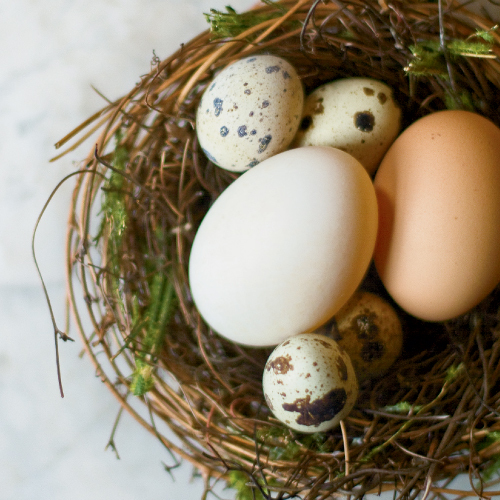 Although ubiquitous, chicken eggs are not all the same. Color and nutrients vary depending on the way the chicken was raised. To see the difference, you have to crack the shell. Pasture-raised chickens feast on bugs and worms, so their eggs have orange yolks while those of factory-farm eggs are yellow. Where to Buy: Farside Farms in Weaverville raises cage-free chickens with homemade feed, and many grocery stores around Asheville stock their eggs. To learn more about Farside Farms and other regional egg producers, check out the Appalachian Sustainable Agriculture Project’s regional food guide, www.buyappalachian.org. Duck eggs are the Cadillacs of the egg world. About two-thirds larger than chicken eggs, they offer more vitamins, protein, and flavor. Chefs love them for their richness and ability to elevate savory dishes. They create a particularly decadent carbonara sauce, plus pillowy omelets, quiches, and scrambles. Keep in mind­—the exact size of the eggs depends on the duck that produces them. For an exact conversion for your recipes, weigh your eggs with a kitchen scale. Where to Buy: Duck Dance Farm in Burnsville raises a range of duck breeds, from petite bantams to large Silver Appleyards, and also provides a sanctuary for six endangered species of waterfowl. To learn more about buying eggs or touring the property, visit www.duckdancefarm.com or call (828) 675-2012. Tawny brown and covered with intricate speckles, tiny quail eggs are almost too pretty to eat. Almost. Beneath that delicate shell, there’s a full-flavor delicacy with a high yolk-to-white ratio. Fry, poach, or boil them and serve atop salads and hors d’oeuvres. Keep in mind, quail eggs are about one-fifth the size of chicken eggs, so if you’re going to substitute them in recipes, you’ll need to buy in volume. Where to Buy: LMP Mini Quail Farm in Asheville is home to about 100 birds. The eggs are available at French Broad Food Co-Op in Asheville and at the Saturday farmers market in Leicester (March through November).